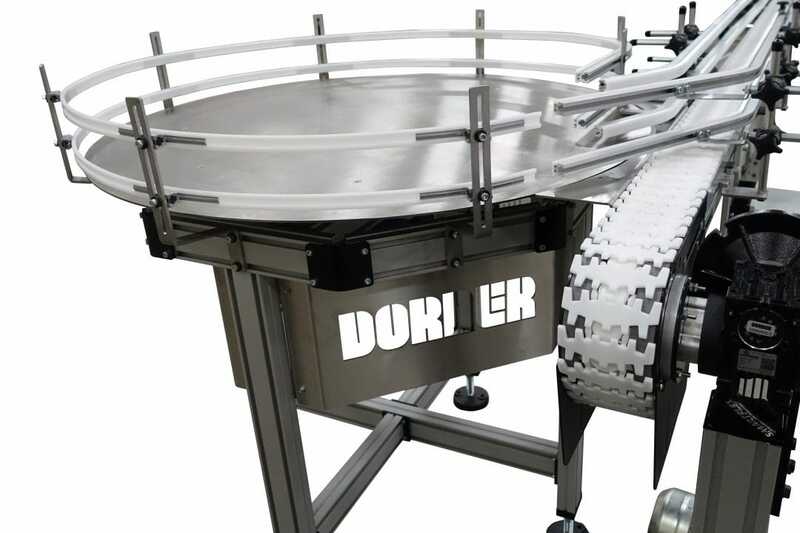 Dorner recently worked with a customer who needed to accumulate product before it was manually packaged. In the past, we have accumulated products on low friction conveyor belts (seen here) and on recirculating conveyors (seen here and here). For this application, a custom rotating accumulation table was built to hold small runs of bottles which would then be unloaded by hand. Dorner provided two systems to be integrated into the discharge of the customer’s injection molding machines. 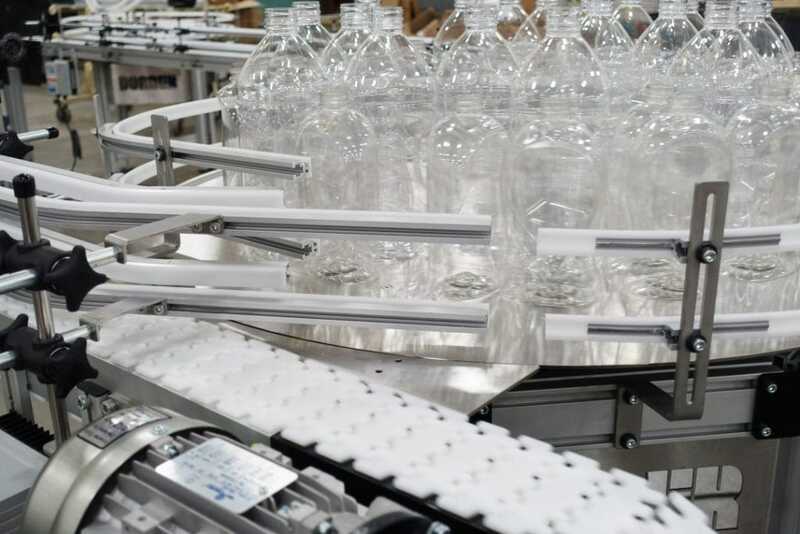 As the facility products a variety of bottle sizes, the infeed height and guiding on the conveyors had to be fully adjustable. Bottle sizes ranged from about 5 ¼” – 10” in height and 2 ½” – 4 ¼” in width. To accommodate the various infeed heights, a pivoting knuckle was created which provides up to ± 10 degrees of adjustment. A custom quick adjust pillar stand was also created to assist in fast changeover between bottle sizes. This allows the conveyor infeed height to be adjusted as needed with a simple hand crank. The 2200 Series SmartFlex was used for the conveyors because their flexibility allowed for inclines and curves on a single conveyor. 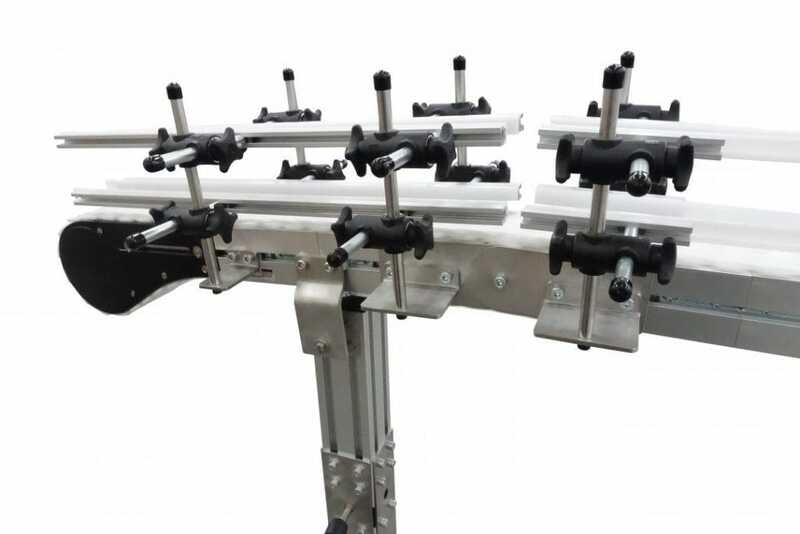 The conveyors were also equipped with adjustable stands and double rail adjustable guiding. 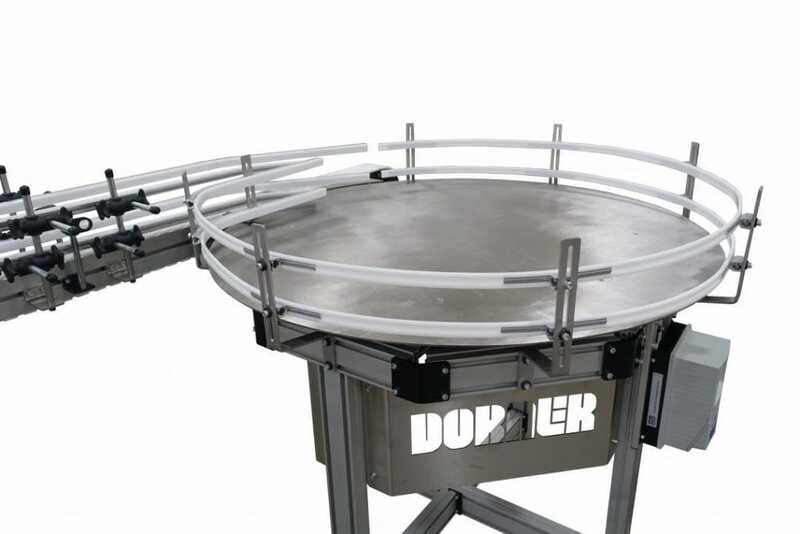 The accumulation table measured 42” in diameter and is equipped with a stainless steel top. The guiding is designed to push the product layers inward with each rotation of the table, allowing for new incoming product to enter the accumulation table without disruption. Watch the video below to see the accumulation table in action.